The new iPhone X features richer colors thanks to a new technology called OLED that other vendors such as Samsung are also rolling out. Also introduced, an upgraded Apple Watch, which can make phone calls and access the internet without the user carrying an iPhone. The phone features wireless charging, an infrared camera and hardware for facial recognition, which replaces the fingerprint sensor for unlocking the phone. The home button found on previous iPhones is also gone, and users instead tap the device to wake it up. The phone, which is priced at $999 and ships on Nov. 3, as well as the holiday shopping season that follows are the most important for Apple in years. The new phone’s ship date raised questions about possible supply constraints ahead of the holidays. Apple normally ships new products within a week or two of announcing them, though Cook said the later date was consistent with earlier guidance to investors. “It’s great to have a product but we’d have liked it sooner rather than later, more like the beginning of October or mid- October,” said Kim Forrest, senior equity research analyst at Fort Pitt Capital Group in Pittsburgh. Apple shares were last down 0.6 percent. They had traded as much as 1 percent higher during the launch event. The company has sold more than 1.2 billion iPhones over the past decade and ushered in the era of mobile computing, but last year had a substantial decline in revenue as many consumers rejected the iPhone 7 as being too similar to the iPhone 6. The screen on the iPhone X is about the size of the current iPhone 7 plus, though the phone is smaller. It features richer colors thanks to a new technology called OLED that other vendors such as Samsung are also rolling out. But in an embarrassing moment for Apple senior vice president Craig Federighi, the face ID unlocking did not work on his first attempt during the on-stage presentation. Apple also introduced the iPhone 8 and iPhone 8 Plus, which resemble the iPhone 7 line but have a glass back for wireless charging. The new phones feature Apple’s first proprietary graphics processor, which provides greater speed, improved cameras and some features for augmented reality apps. The cheapest phones have 64 gigabytes of memory, up from 32 gigabytes in previous models, and will sell for $699 and $799. The company also introduced an upgraded Apple Watch, which can make phone calls and access the internet without the user carrying an iPhone. The Series 3 watch will cost $399. Apple did not provide sales figures for its watches, but Cook said sales had risen 50 percent from the year before and that the Apple Watch was now the best-selling watch in the world. Gene Munster, an analyst with Loup Ventures, believes sales of the watch could double or even triple because of the new connectivity. An upgraded Apple TV will support the high resolution display known as 4K and will feature more programming options as Apple steps up efforts to cut content deals and produce its own shows. Cook opened the event at the Steve Jobs Auditorium on Apple’s new campus with a tribute to the company’s co-founder and former CEO Jobs, who died in 2011. The Apple building itself was considered to be Jobs’ final product, and Cook spent a few minutes boasting about the design, energy-saving features and public spaces at the new campus, including a flagship Apple Store. The theater, never before open to the public, features an expansive glass-enclosed lobby, with two massive white stone staircases leading down to the auditorium. Inside, the decor is similar to that of Apple’s stores, with hard maple flooring and tan leather seats. 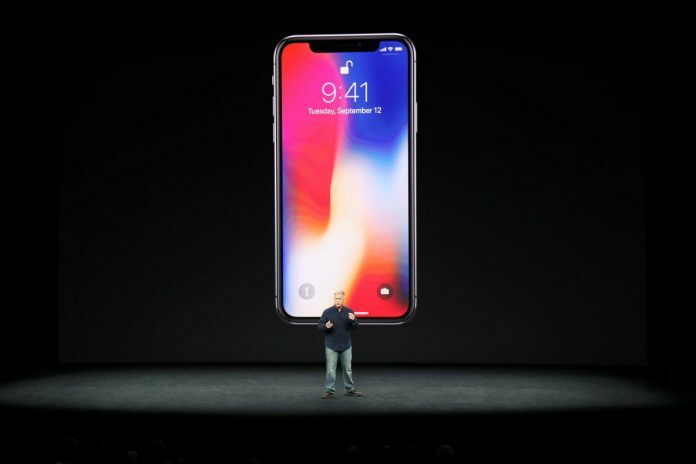 In a major product launch at Steve Jobs Auditorium, Apple Unveils a Redesigned, Edge-to-Edge Display iPhone X which is priced at $999 and ships on Nov. 3.